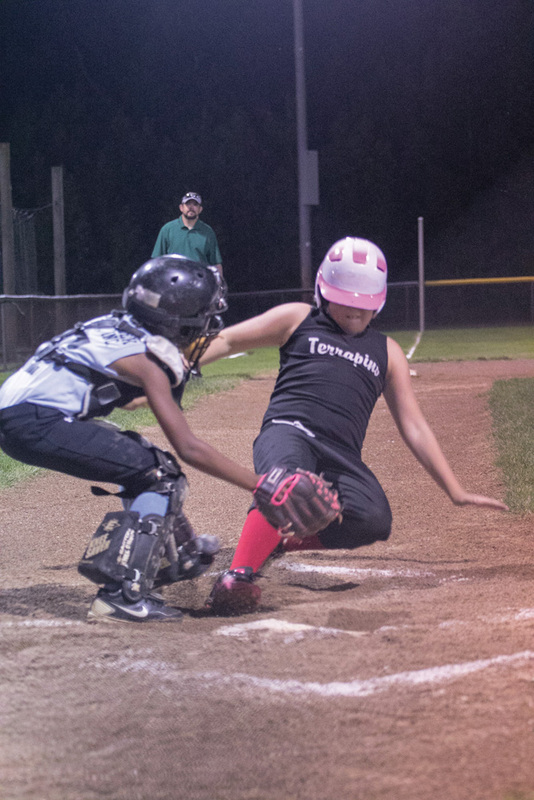 A runner from the Terrapins slides into homeplate during the 2018 Pat Knight softball championship game. It was the last game in town on Sunday night, and it was yet another summer championship for the Lower Sussex Little League to celebrate. The LSLL 8-10 softball team captured the 2018 Pat Knight softball title with a clean sweep through the pool play and final. They defeated Cape 15-5 to pick up the tourney hardware. The pitchers for LSLL were exceptional, allowing no hits through their four games. In their pool-play games, LSLL defeated Cape (15-7), Nanticoke (15-5) and Millsboro (14-10). All the games were hosted at the Lower Sussex Little League complex and played on Comiskey Park Field. The team consisted of Addelyn Clark, Sophia Bowen, Zoe Quillen, Parker O’Shields, Isabel Scott, Tamiyah McCabe, Mariah McCabe, Maggie Bare, Jaelyn McCray, Autumn Wille, Makayla Acri and Taygan Conaway. Extra bases — In the other pool-play games, Nanticoke defeated Millsboro (17-16), Cape beat Millsboro (11-4) and Cape upended Nanticoke (15-10). Cape finished 2-1 in pool play, while Nanticoke posted a 1-2 mark. Millsboro battled tough in all of their games but finished 0-3 in pool play.